Considering the “sustainable” inspiration behind the Lighting Project, it seemed only fitting that the live rock used in the Lightning Maroon’s final home shouldn’t be hacked off a reef or dug out of a lagoon. It was that inspiration that got me looking around at more sustainable rock choices. Of course, the most sustainable live rock might actually be the live rock that’s already been collected and harvested, so I had purchased “used” live rock from a fellow hobbyist (Josh G.), covered in various blue, green striped, and green fuzzy mushroom anemones. But of course, when my local SPS guru Jay H. saw that I wanted to use that rock, he kinda had a heart attack! Apparently, mushrooms in a SPS tank tend to be problematic (aka. take over, sting your SPS etc.). So that rock was nixed, and I was back to square one. 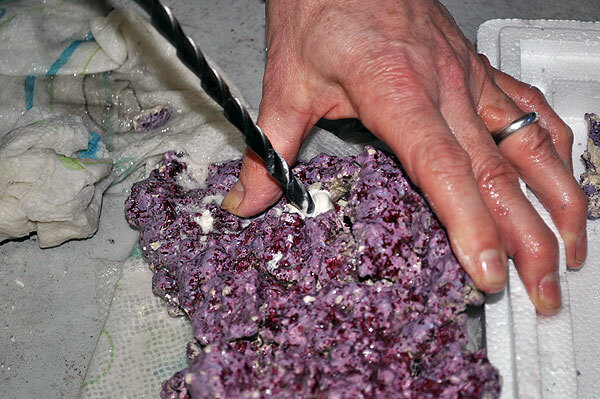 As you may know there is more than one company in Florida who use terrestrially-sourced rock, place it in the ocean, and harvest it after a year or two (Tampa Bay Saltwater, Sea Life Inc and many others). 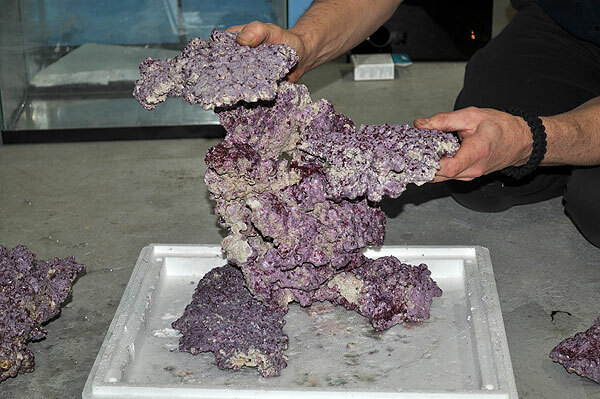 Of course, dry rock has taken the aquarium hobby by storm, with both Bulk Reef Supply and Marco Rocks being two popular sources. Then there’s ceramic rocks. Not to mention the various DIY rocks that hobbyists have come up with. All these dry and man-made options have the downsides of being very sterile and stark, taking months to become fully covered in coraline algae. Florida live rock was looking like a good choice. 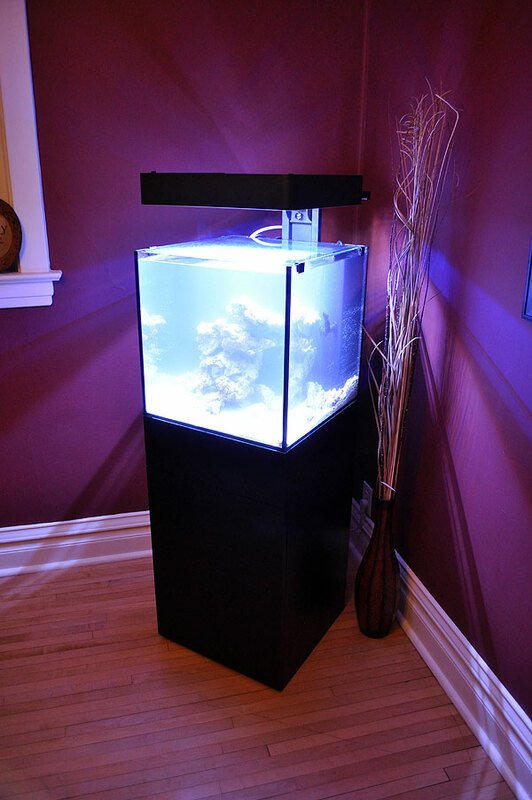 Of course, I had just recently noticed a product called “Real Reef” Live Rock in the Diver’s Den section @ LiveAquaria.com. 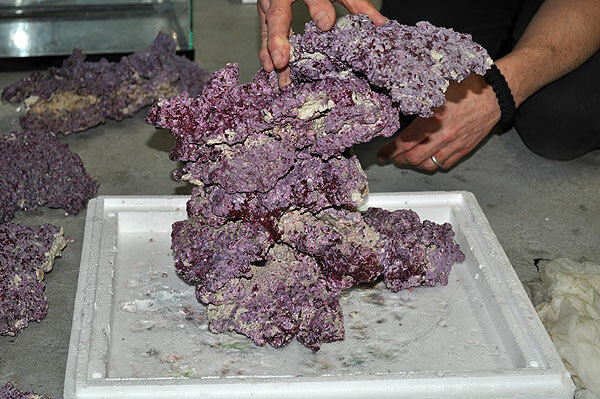 I asked Kevin Kohen (Director of Live Aquaria) about this rock, and that’s what led to a sampling of both Real Reef Live Rock (from Fish Heads Inc) and Fiji Cultured Live Rock (Sasaul Tawamuda Live Rock from Walt Smith International). 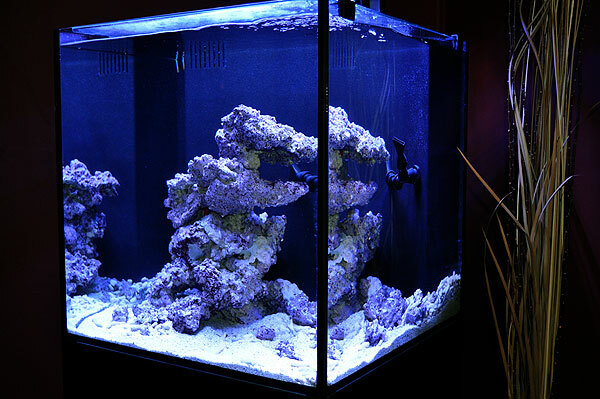 That ultimately led to a “battle royale” of these two man-made, aquacultured live rock products on Reef Builders. Truly, both products wound up being “different” but “equal”, a true draw. 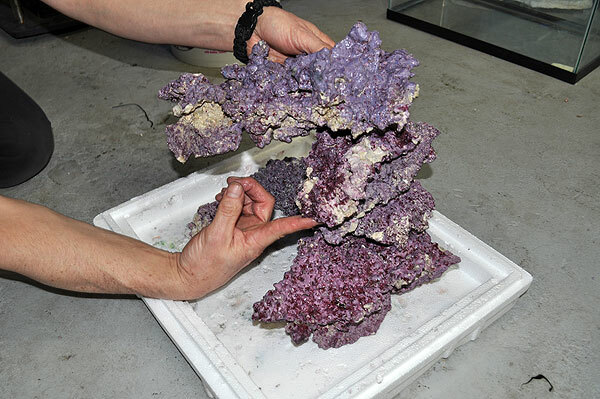 Any decision a hobbyist may make between the two would come down to individual preferences and trade-offs given the materials and the way each rock was cultured. 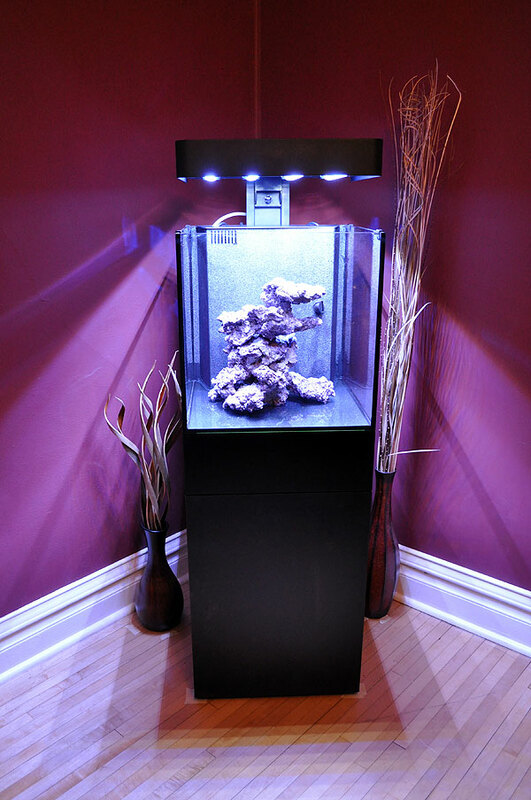 Personally, for the Lightning Project, if I was choosing between all the various cultured live rock options out there, Real Reef Rock ended up being the winner for one big reason – it never touches the ocean. It never sees fish. There is zero chance of hitchhikers or parasites coming on this live rock. So when thinking about the live rock that will ultimately share the tank with a one-of-a-kind, irreplaceable clownfish, the fact that it was parasite and hitchhiker free helped Real Reef live rock beat out all other contenders. 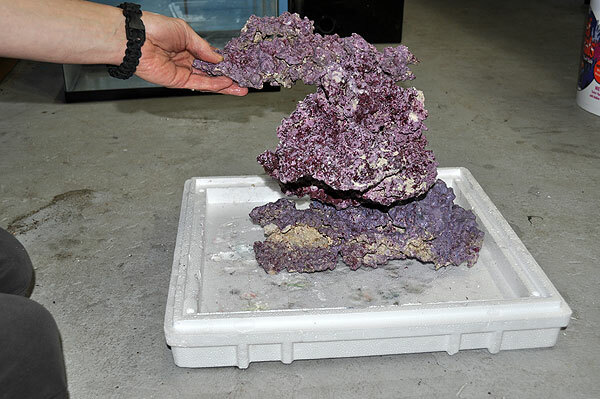 Of course, as it happened, Mark @ Fish Heads Inc. told me they were just about to release 2 new variations of Real Reef Live Rock, and asked if I’d be willing to give these new products (Nano Rock and Shelf Rock) a look and review. 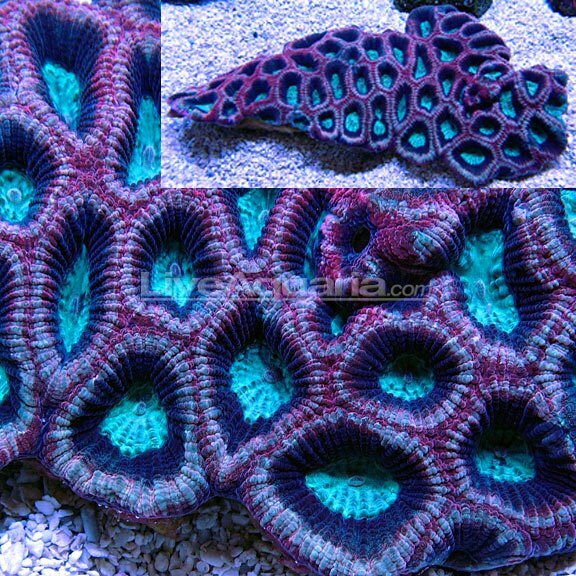 That, and would I be interested in using it for the Lightning Maroon’s tank? Ha! Indeed, this was just the perfect circumstances. Mark reserved some choice pieces, meanwhile selling out of both new products in the very first week! Tuesday, a great looking box showed up courtesy of Fish Heads Inc.
After doing the unboxing (it’ll be on Reef Builders soon and I’ll update a link here), Nick K. and I got busy trying to come up with the aquascape for the Exocotic tank. Coincidentally, the shipping box used roughly matched the inside dimensions of the tank, so the inner portion of the lid was the perfect footprint. We went through 5 iterations of designs that we liked – for each one, we took a shot, and then took shots “disassembling” the rock structure piece-by-piece, so that we could reconstruct whichever we ultimately chose. Aquascape #5 - the one we went with! Obviously, I’m getting ahead of myself talking about livestock…at this point in the story the tank doesn’t even have saltwater in it yet! Still, planning your livestock will certainly help drive your hardscape. Knowing that I’m planning on letting corals grow in, the rockwork was intentionally meant to be a framework, a foundation, and that meant it keeping the amount of rock on the lighter side of things. Once we had settled on the 5th incarnation as the one that seemed the least contrived and yet functionally ideal, we set to the task of making it actually work. That meant drilling the rock, using the fiberglass driveway markers and underwater epoxy putty to make a couple crucial joints. Nick drilling the Real Reef live rock. Of course, we broke a couple of the rocks during the drilling process, but not because of drilling. No, it was the downwards pressure on them keeping them stable. Once things were pegged and glued, the main structure was brought upstairs and placed directly on the glass. The reasoning behind this came from Jay H. again. If the Maroons start digging, the rockwork could fall on the glass. 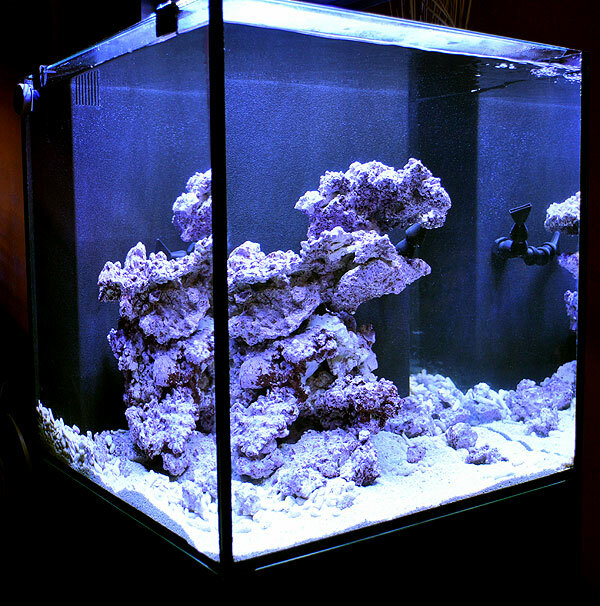 By already being stable and on the glass, the risk of cracking the bottom via shifting rockwork is greatly reduced. The next step? Substrate. Taking a page from how far planted tanks have driven freshwater hardscapes, I didn’t just throw in sand and call it a day. Far from it. First, I laid down a base of about 10 lbs sand, specifically Caribsea’s Arag-Alive, Special Grade Reef Sand. Kept the sand shallow on this one. 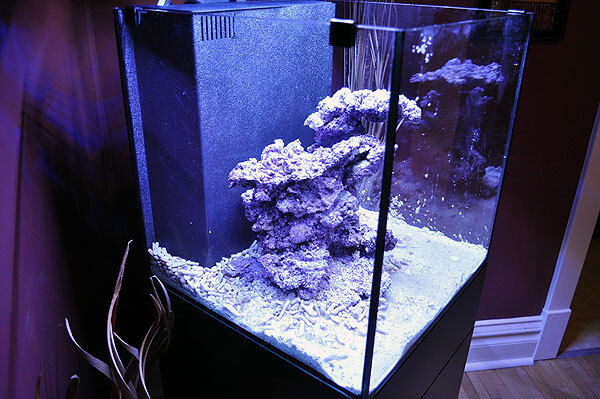 Between this bagged live sand, and the fully cultured and cured Real Reef Live Rock, the “break in period” (aka. the new tank cycling) should be minimal. Next up came the coarser substrate. 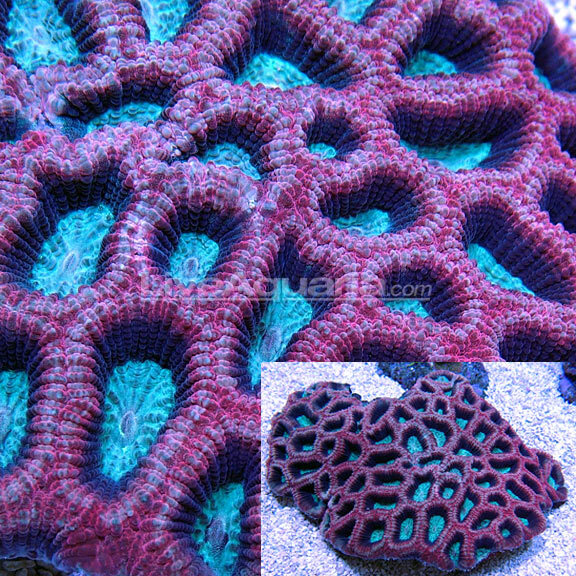 Almost 20 years ago now, I remembered we use to get big bags off coral rubble that we used as a substrate for marine tanks. The size was more pebble-like…some pieces up to 2 inches in length. These days, this rubble isn’t so easy to find. 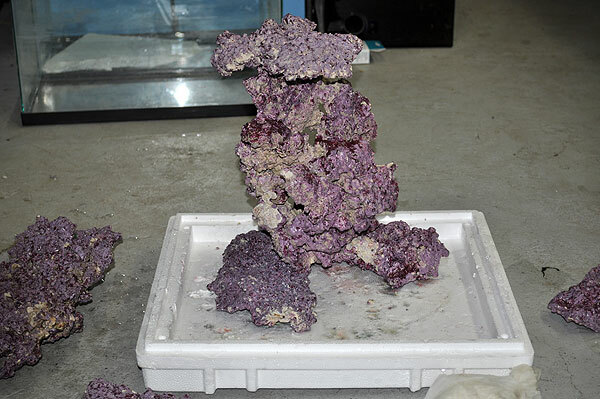 Turns out, I had read about this “rubble” on Reef Builders of all places, referred to as “Coral Bones” in Two Little Fishies’ Reborn Calcium Reactor Media. Given that some companies have moved to other calcium sources for reactor material, I gave Two Little Fishies an email to see if they still used the same material – they do. They even went one-better and sent me some for the aquascaping project. Just like I remembered it – well worn coral branches, like sea glass, this is the “coral bones” I was looking for. I placed the coral bones around the back, and around the base of the live rock, creating a transition between the live rock and sand. I used maybe 2lbs of the 8 lb. batch TLF sent me. 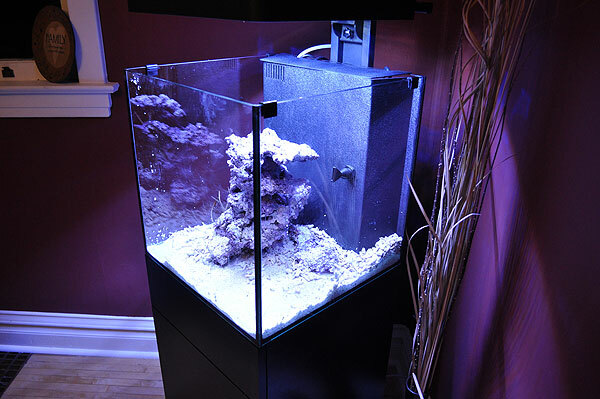 Caribsea Arag-Alive and Two Little Fishies Reborn Reactor Media are added as substrate. A closer look at the substrate design. After that, water was added slowly so the substrate wouldn’t be disturbed. As it happens with fresh live sand, initially, things were pretty cloudy. 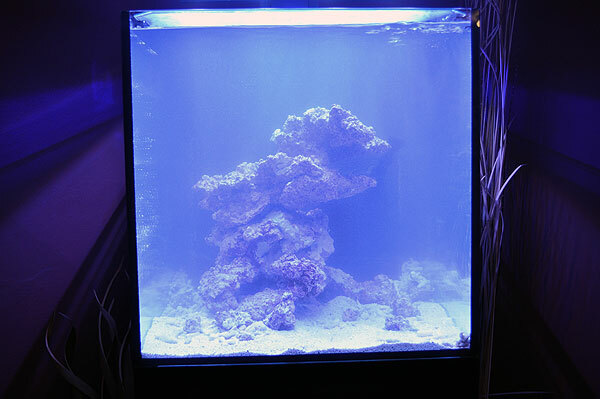 Newly filled with saltwater, things are cloudy. The final touch involved a use of the Real Reef rock rubble. A couple handfuls scattered around the substrate created the missing link. Live rock, rock rubble, coral bones, coral sand. A few pieces of live rock rubble are added to complete the composition. 48 hours later, things had cleared up a bit. Time for some better images! And after taking those pictures, in went the Labrador Maroon. Now we wait for a couple weeks and see how the water quality goes. When things are right, out goes the Labrador, and in goes the Lightning! The past 48 hours have seen a lot of progress. 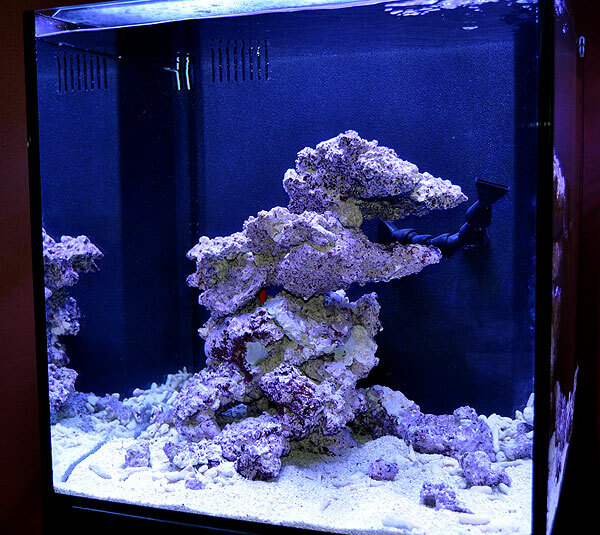 Real Reef Live Rock arrived from Fish Heads on Tuesday. Tuesday evening, Nick and I spent a lot of time in the basement aquascaping before coming to rest on our 5th or 6th main iteration. 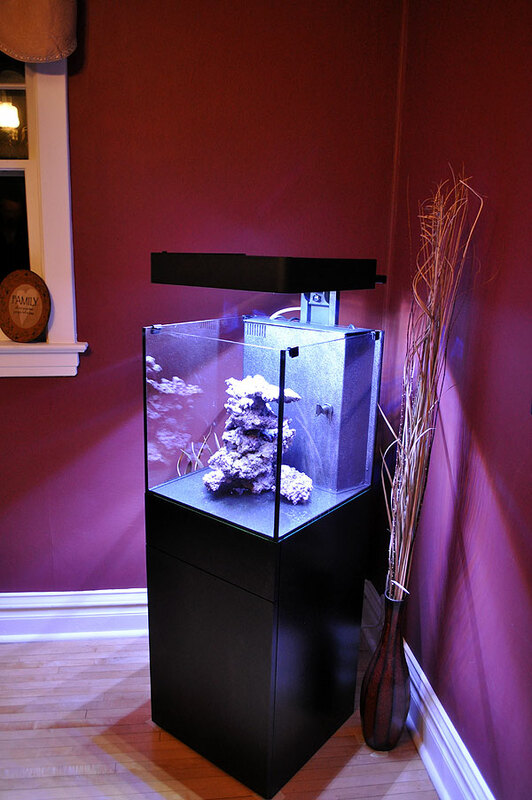 Then we assembled it, brought it upstairs, added in about 10 lbs of CaribSea Arag-Alive Special Reef Grade, accented it with coral bones from Julian Sprung’s Two Little Fishes Reborn calcium reactor media. Let it run for about 48 hours, and the Labrador Maroon went in tonight to be the “test” fish. A FULL detailed writeup and pictures will come, probably sometime over the weekend! Progress IS being made…the Lighting Maroon sits and waits for the “all clear” signal on the Ecoxotic tank, and then the last move will be made!